We’d love your help. Let us know what’s wrong with this preview of Band of Shadows by H.P. Waitt. Friendship and morality play a major thematic role in the book. Scarlet has to work on growing her confidence and inner strength, but she also has to learn to trust and rely on her friends. She has never known her family and has spent most of her childhood bouncing from foster home to foster home, so trust is a nearly foreign concept to her. Since Scarlet is uprooted from her normal life and thrust into the mystical world of Avalon, her coming of age story is quite tumultuous, both her strength and her morality will be tested time and time again. Luckily she has her friends, Stiles, Lena, and Ryker, who are a lovable mix of intelligent, loyal, and witty (often quite sarcastic) to show her the ropes. There is also an underlying theme of turning your weaknesses into your strengths. When the book begins, Scarlet is in therapy for depression and anxiety, and she views the symptoms as a weakness. But in truth, the symptoms reveal her powerful abilities, and are actually her greatest strength. The message serves to not only turn weakness into strength, but also to de-stigmatize mental illness. The novel is a work of fantasy fiction that includes fantastical powers and abilities, mystical lands, plants with hidden powers, and a battle for what is right. To ask other readers questions about Band of Shadows, please sign up. I received a copy of this book from the publisher, BookBaby, and the author via netgalley in exchange for an honest review. Scarlet has been in the foster system her whole life. She's been shunted from house to house and finally she's in one that's good. She lives with a group of other foster children, and for the most part, life is good, at seventeen she finally feels like she's been placed in a good house, just for her to be out on her own in less than a year. After weeks and weeks of disrupted sleep due to a recurring dream about a strange door, Scarlet, along with her best friend (and fellow foster child) Jensen are on their way to a sports game, only for Scarlet to find the door. What happens next is as amazing as it is unbelievable. The next day Scarlet and Jensen go back to the door, when Jensen has no luck in making it budge, Scarlet gives it a try, and is unceremoniously dumped onto the greenest, most lush grass she has ever had the pleasure of seeing. In no time at all she is separated from Jensen, finding out that she is a Faye who has powers, and that this is a world on the brink of war against Iladwyn and the band of shadows. You know, all in a day's work and all that. Will Scarlet be able to adjust to this life of magic and wonder? And who is Iladwyn? The premise of this book had me hitting request as fast as my little fingers would let me. A girl growing up in foster care, who at seventeen, finds out that she's magical. SIGN. ME. UP! I had a bit of a problem with the pacing at the beginning of this book though. I actually considered DNFing it a few times because it just wasn't moving, but I have a strict policy on ARCs where I don't like to DNF unless I just cannot do it. Luckily this story kept me hooked with the promise of so much more that I stuck with it, and I'm super glad that I did. The beginning of the story is all about setting up how regular Scarlet is, that's what I took from it anyway. It literally just goes through her normal day to day activities, and her not really doing anything but living. So I guess you could put the first quarter of the book (roughly) down to a slice of life story about a foster child who's not far from leaving the system. I don't mind slice of life, if I'm honest, I'm quite a sucker for a slice of life anime. This one just felt a bit boring in the beginning for me. So I implore you, if you are finding that it's a bit stagnant and you're getting bored, STICK WITH IT. I promise you that the story picks up and becomes incredibly engaging. I like the character of Scarlet. She's likeable and doing her best to deal with this unbelievable circumstance that she finds herself in. I love that she was questioning the reality of it all. It's always hard to get behind a character who is thrown into this totally unbelievable situation and responds with "oh okay, this is a thing, cool". I want a little bit of believability, in my stories and characters, no matter the genre. If something is out of the ordinary, I want my character to question it, to be a bit weary. I was really liking the character of Jensen too, but to my slight disappointment, we leave him in the beginning of the book and we don't really come back to him bar the epilogue, so I'm really hoping that Waitt revisits his character in the books to come, because I want to know more about Jensen and how he is really dealing with Scarlet's disappearance. I want him to have an active as possible role in this story. The other Faye that we meet in Avalon are all written really well, and I enjoyed every single one of them, even the douchebag characters, that's how well they are written. I especially like how Stiles, Ryker, Lena and Morgana are written. I also have an incredible soft spot for Declan and I can't wait to see where his story goes. I absolutely love that Morgana is written in such a way that we question her, I thought that was brilliant. I loved the little bits and pieces that really made up Avalon. I absolutely ADORED the anigma game. WHAT A BLOODY FANTASTIC IDEA!! I wish anigma was real because I would SO be a part of that. I'd want to be placed on the purple team, because, you know, cool characters and all. The magic system was explained beautifully and there is no difficulty in understanding it whatsoever. I love that idea that each Faye gets two powers - one from each parent and then their own power as well. It really is such an interesting aspect of this story and I loved finding out each and every person's powers. This book was given to me by Smith Publicity in exchange for an honest review. I want to start off with the good things about this book, and I am going to try and be honest without being mean. This is going to be as objective as possible. There are books that I DNF (Did Not Finish) in the past and unfortunately this one is joining my short list of books I couldn’t get through. However, I understand that first time authors need time to grow and really understand their voice and style, which is the main reason I gave this book two stars instead of one. I’m a tough critic when it comes to writing, grammar and overall flow, content and development of characters. I can admit good writing even when the style and story isn’t particularly my taste. However, even with the book sounding like it would be my taste, it failed to deliver a good, well-written story. I made it seventy-five percent of the way through this book before deciding that I just couldn’t drag myself through it anymore. The good thing about this book is you can tell that the author really tried and it actually started off with a good hook. The summary and the first few chapters were great! The way Waitt started her story definitely gave way to interest. I wanted to see what happened and I wanted to know what and where that door was, but as we traveled farther into this story I, unfortunately, couldn’t care less. Where the characters had some pieces of fun and natural banter, most of the dialogue was clunky, and uncomfortably choppy. The overall flow of this book was awkward and read more like an informative textbook rather than a fantasy tale. The cadence and grammar of this novel are probably the worst part. I understand that I had an ARC of this book and I hope much was fixed before publication because between incorrect usage of words and run-on sentences, this book was very poorly edited. Scarlet has found her way home but war is in the air and she is going to have to get some s Scarlet is seventeen and been in the foster system her whole life. She suffers from depression and anxiety. She also doesn’t feel like she fits in and dreams of a strange door. Once day she finds herself in front of this door and transported to Avalon. She learns that she is a Faye, a race that was nearly completely destroyed in the last war. That she is an empath which explains her depression and anxiety. For lack of better words, this was an amazing read. It's astonishing that Waitt is a first-time author, given that she has such a grasp on plot and character development that's typically reserved for more seasoned writers. The overall content from the world to the characters that live in it -- with motifs inspired by King Arthur -- provides a fresh perspective within the fantasy genre as well; rarely do we get to see a deviation from magical beings like wizards and vampires, and the powers/abili For lack of better words, this was an amazing read. It's astonishing that Waitt is a first-time author, given that she has such a grasp on plot and character development that's typically reserved for more seasoned writers. The overall content from the world to the characters that live in it -- with motifs inspired by King Arthur -- provides a fresh perspective within the fantasy genre as well; rarely do we get to see a deviation from magical beings like wizards and vampires, and the powers/abilities common to them. The protagonist, Scarlet, is an Empath (within the grander race of Fayes) who uncovers her identity through a series of fantastical events on Avalon, an island that is magic in its own right. We see Scarlet's struggles and successes that come with acclimating to her newfound abilities, the new world, and the people in it, but the true journey lies within Scarlet's recognition of her internal power and acceptance of herself as an "outsider". 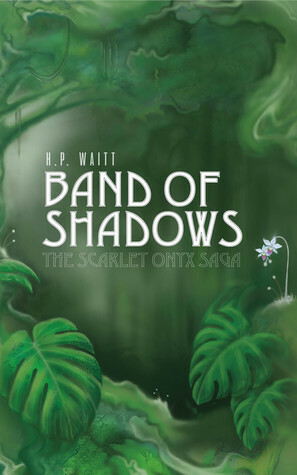 While we get introduced to characters that may be generally labeled as "good" or "bad," Waitt does an impeccable job of blurring the lines -- particularly through the lens of Scarlet's Empathic ability -- enabling the reader to go through his/her own rollercoaster of emotions. This, coupled with the relatability of the characters, is truly the mark of great writing. Band of Shadows is the perfect marriage of science fiction and fantasy. Scarlett is powerful but flawed, and makes a compelling hero, while staying away troupe-ish "Mary-Sue," know-er of all, most powerful of all stereotypes we commonly see with heroines. Not needing magic to give her strength, she pulls from within to train and ready herself for the battle ahead. Onyx, the leader of the Band of Shadows, is an interestingly gray-charater that will make you feel uncomfortable in a good way. No lo Band of Shadows is the perfect marriage of science fiction and fantasy. Scarlett is powerful but flawed, and makes a compelling hero, while staying away troupe-ish "Mary-Sue," know-er of all, most powerful of all stereotypes we commonly see with heroines. Not needing magic to give her strength, she pulls from within to train and ready herself for the battle ahead. Onyx, the leader of the Band of Shadows, is an interestingly gray-charater that will make you feel uncomfortable in a good way. No love triangles to be seen, and with most YA cliches left far behind, this book comes highly recommended. We can't wait for the next one in the series!!! Not since I read Harry Potter over a decade ago has there been such a compelling fantasy fiction novel that I just COULDN’T PUT DOWN! I’m normally a voracious reader of historical fiction and thrillers, but this captivating story completely sucked me in and totally surprised me! I’m 43 yrs old and think readers of any age will not only see a little part of themselves in Scarlet, but also thoroughly enjoy her magical journey into the wondrous world of Avalon! I couldn’t recommend this book more h Not since I read Harry Potter over a decade ago has there been such a compelling fantasy fiction novel that I just COULDN’T PUT DOWN! I’m normally a voracious reader of historical fiction and thrillers, but this captivating story completely sucked me in and totally surprised me! I’m 43 yrs old and think readers of any age will not only see a little part of themselves in Scarlet, but also thoroughly enjoy her magical journey into the wondrous world of Avalon! I couldn’t recommend this book more highly, it is a definite must read! This unique story about a very interesting young girl will have you turning pages. It all begins in an ordinary foster home and as the story unfolds you won’t believe the incredible places and adventures Scarlet embarks on. Get transported to one of the most magical and blissful worlds and allow your imagination to run free. I cannot wait for the next one!